Jaw Pain: What’s The Best Solution? 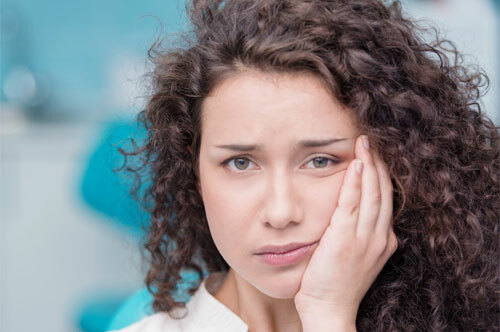 Have you ever woken up with a throbbing pain in your jaw? How about suffering from headaches, stiff facial muscles, and difficulty chewing? All of those problems are symptoms of temporomandibular joint disorder, or TMD. We’ve treated a lot of patients at Really Smile Dentistry who’ve suffered from pain in their temporomandibular joints, or TMJ. The joint that hinges your jaw is a simple contraption but things can still go seriously wrong with it. In many cases the symptoms can be treated and relief can be found through oral appliances designed to manage discomfort. But do you want to simply treat your pain without ever finding a real cure? TMJ Pain: What Causes It? There are a lot of different causes for pain in your TMJ. In many cases it’s related to things you can’t control, like arthritis, a slipped cartilage disc in the joint, or physical defects with the shape of your jaw. Those problems don’t all happen independently, however, and it’s usually the case that you’re suffering from pain because of an underlying condition that’s stressing your muscles. Have you ever had a sore shoulder that just wouldn’t feel better no matter what you did? You may have thought it was a pinched nerve or something serious, but in most cases it’s simply a case of your muscles being used incorrectly. A lot of people experiencing chronic pain in their shoulders have it because they sit incorrectly, slouch, have bad posture, or simply pull a shoulder up toward their neck when stressed or using the computer. Pain in your TMJ is a lot like that: it can be caused by underlying issues but often times it’s simply a case of bad muscle use. While you can usually notice if you have poor posture or aren’t sitting at the computer correctly it’s hard to tell when you aren’t using your jaw muscles right: they aren’t exactly visible or easy to notice! In those cases you can still find relief from a sleep guard or other oral appliance that helps your mouth relax, but that isn’t the whole picture. You’ll feel better but it might just be temporary, or it might not even address what’s really going on: years and years of bad bite behavior that’s resulted in poorly trained muscles! We practice an advanced form of dental manipulation at our Carmel office called neuromuscular dentistry. It might sound complicated but the principle is really simple: your brain isn’t used to using your jaw muscles correctly so we need to retrain it just like we would in any other kind of physical therapy. It starts with a series of comprehensive exams designed to determine just what’s going on in your jaw. In many cases we might find out that you’re biting incorrectly, favoring certain parts of your mouth, or suffering from any other kind of muscular problem you can think of. If you’re a candidate for neuromuscular dental therapy we’ll probably do a lot more digital imaging and testing as well. We want to get a complete look at your jaw, teeth, muscle structure, and face shape so that we know precisely how to treat you! We’ll follow up your initial assessment with the development of an oral appliance that you’ll wear pretty much all the time for the first period of treatment. The device will hold your mouth in a comfortable, neutral spot that will teach your brain a new “home position” for your jaw. Once you’re used to where your jaw should be sitting comfortably we’ll start the next phase of your treatment and work on your bite itself. Over time we’ll completely change the way your jaw functions, and in the vast majority of cases patients experience complete and long-lasting relief from TMJ pain. Treatments that go along with neuromuscular dentistry can also include orthodontics and other jaw-adjusting therapies. In some patients the bone position or teeth alignment needs to be adjusted as well. Don’t Settle For Relief: Get The Cure! You don’t need to settle for simply relieving pain and discomfort with oral appliance therapy. Let us get to the root of your problem at Really Smile Dentistry so that we can have you living comfortably without the need for continued treatment! To find out what’s causing your pain and determine if neuromuscular therapy is for you call our Carmel office today at 317-451-4050. You can also request an appointment by filling out our online form. We look forward to seeing you!